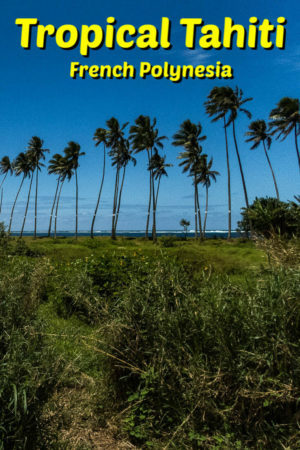 Tahiti instantly conjures up images of an exotic tropical paradise. For us, it was a cruise port that I could hardly wait to reach as we crossed the Pacific. Sailing first from Los Angeles to Tahiti and then home to New Zealand, French Polynesia was to be one of the highlights of our three weeks at sea. Once off the ship, there are several companies offering similar tours around the island. The woman who recruited us was personable, spoke perfect English, and sold her tour well. However, there were no reviews or personal recommendations to read. We gave her our money and then she escorted us to a vehicle. Unfortunately, our driver only spoke about 20 words in English and refused to stop along the way for photos, despite our ‘saleswoman’ having featured this in her pitch. The experience was a reminder as to why we normally pre-book our tours in special places. As a result, we have read reviews of many tours and found similar complaints about most of the tours. If we had done our typical research in advance, we would have taken this Tahiti Island Tour. 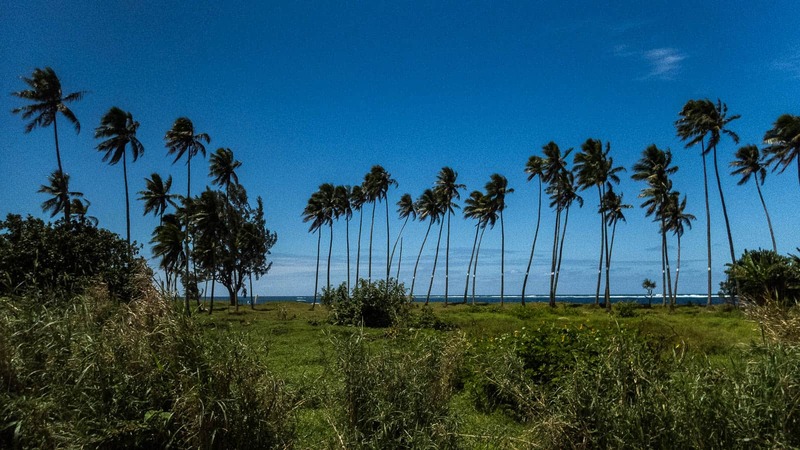 Here are the highlights driving around the island from Papeete. This exotic island captivated us despite our driver’s lack of enthusiasm. 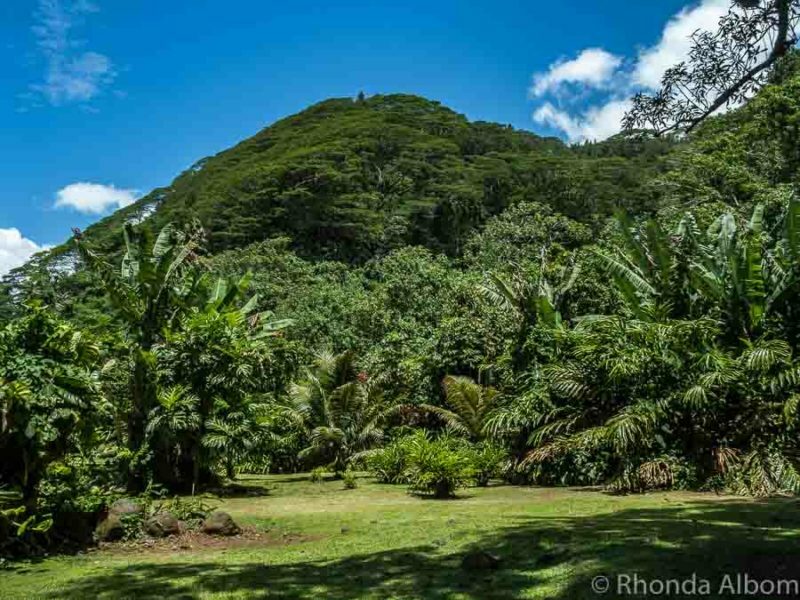 The five-minute walk through lush tropical rainforest leading to Maraa Fern Grotto is a stunning example of everything one would expect to find on the island of Tahiti. 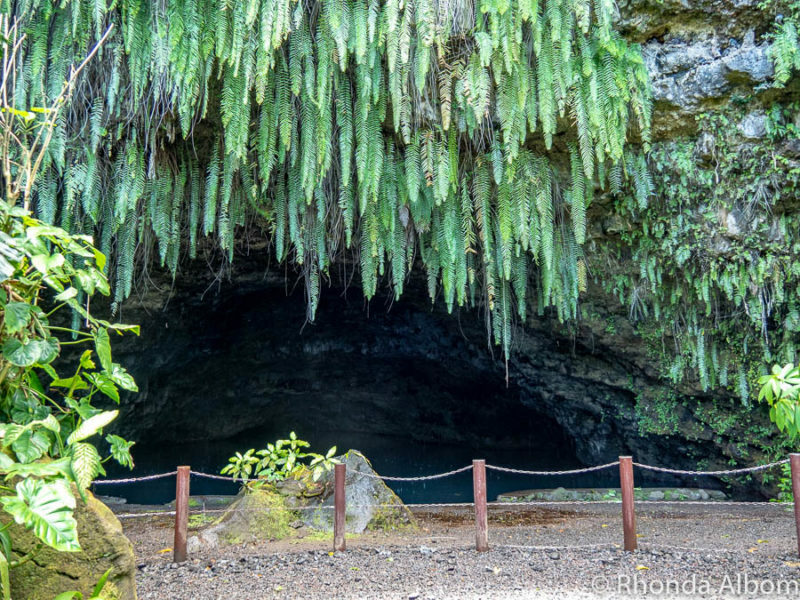 Maraa Fern Grotto holds Tahiti’s largest underwater cave. French painter Paul Gauguin wrote about his experience swimming into the cave through the cold water. Gauguin lived on Tahiti twice between 1891 to 1901. Entry to the grotto is free. 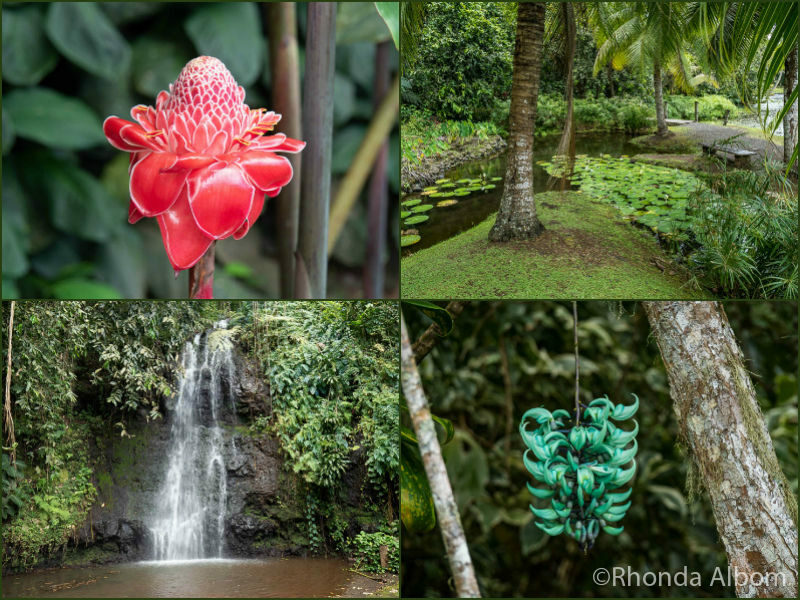 Unusual flora caught my eye as we entered the manicured tropical paradise of Vaipahi Gardens. There are three walking trails here, each recommending about 30 minutes to complete. Nevertheless, it’s a place to relax and enjoy; to stroll, savouring the fragrant aromas and colourful sites. Unfortunately, our driver only allocated 30 minutes for this stop. As a result, we barely had time to do one trail and stop for a photo of the not very impressive waterfall. Entry is free to these impressive gardens that feature 75 plant species from around the world. Legends and myths written on signposts throughout the gardens are in both English and French. Vivid tropical flowers, lily pads, and a waterfall were amongst the sites on the ground of the Vaipahi Gardens. 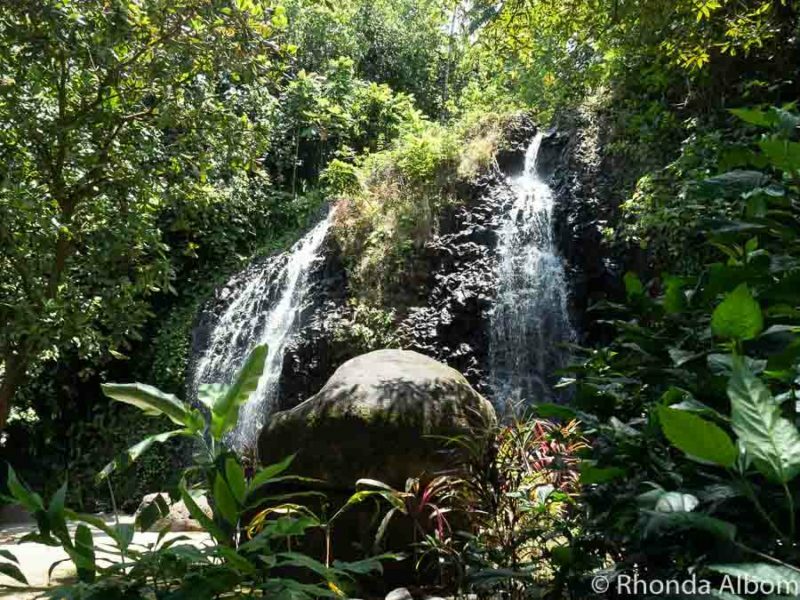 Les 2 Cascades, or twin waterfalls in English, are located just beyond the town of Taravao. While beautiful, they were not as special as I had expected. In fact, they are not one of the well known Tahiti waterfalls, but rather a convenient stop as they are close to the main road. 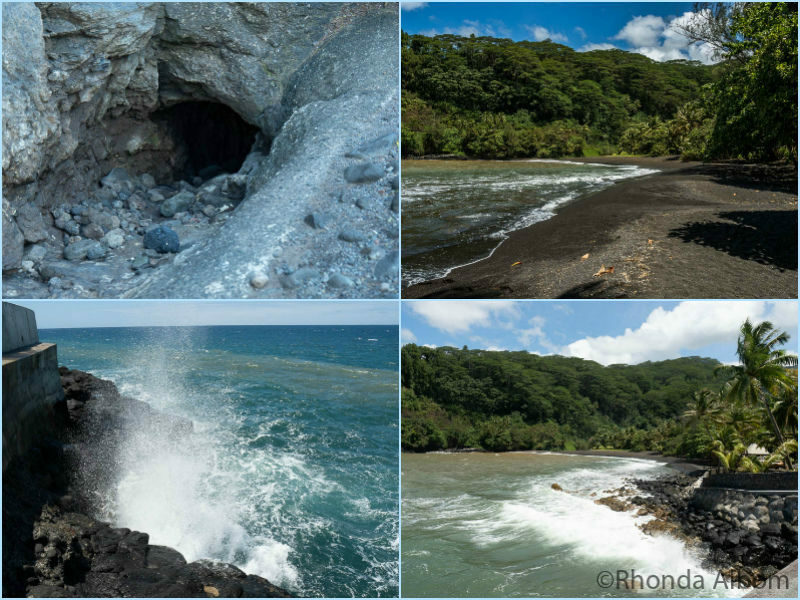 Surf pounding against the headlands forces water and air into ancient lava tubes. The result is a blowhole that was surprisingly quiet while we were there. There is a second blowhole that shot mist into the sky. We managed to stay dry, a story that we understand would have ended differently had the main hole been blowing. Arahoho Blowhole (not blowing), black sand beaches, and mist rising from a second blowhole. 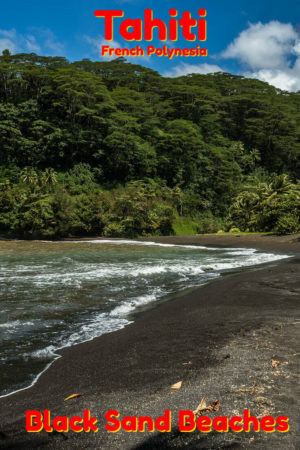 Another black sand beach on a spot made famous by Capitan Cook is Point Venus. It was here that Cook’s expedition set up an observatory and watched the transit of Venus across the sun in 1769 during his work for the Royal Society. Well-known explorers William Bligh and Wallis also anchored here. The lighthouse at Point Venus was designed by Thomas Stevenson, the father of author Robert Louis Stevenson. Our driver skipped this location. Blooming with colourful flowers, a lone tree stands upon the hill near where we stood to enjoy the view overlooking Matavai Bay and the island of Moorea in the background. Capitan Cook used this tree as a navigational landmark, thus giving Tahara’s Hill the nickname of One Tree Hill. Looking out over Matavai Bay. Papeete is the main city on the island of Tahiti as well as being the capital city of French Polynesia. It is the port of entry when cruising to Tahiti. 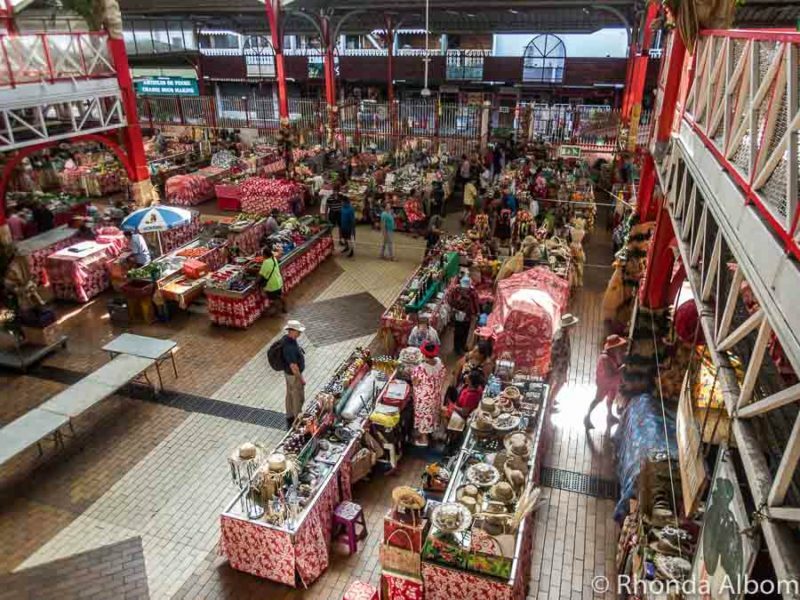 Crafts, food, souvenirs, clothes, flowers, Tahitian pearls, and just about anything else you might want is sold at the two-level indoor Papeete market. Live music is often available in the afternoons. Here you can bargain for a better price. As the capital city, the main government buildings are located in Papeete. The assembly consists of elected members. By law (since 2001), there is an equal number of male and female assembly members in the Assembly of French Polynesia. 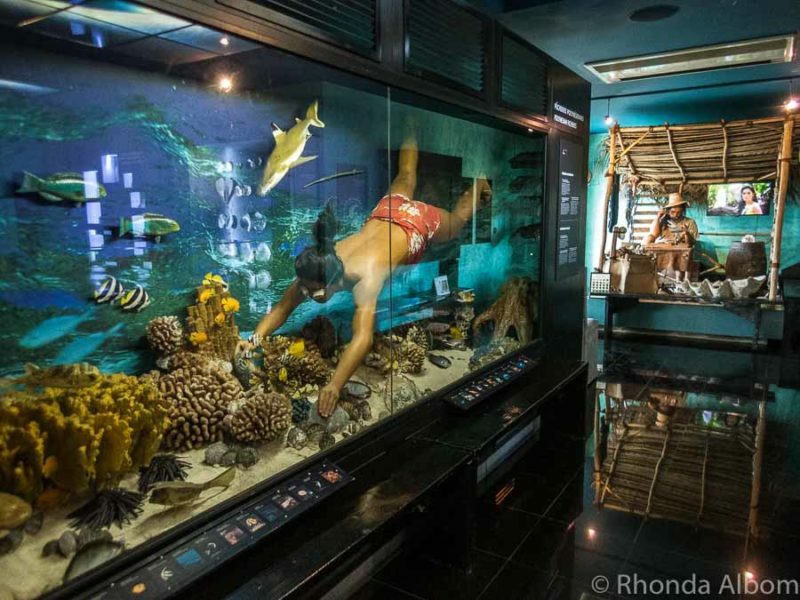 A small two-room museum, the Robert Wan Pearl Museum dedicates itself to the history, harvesting, and tools for selecting Tahitian pearls. The museum is free to enter, they offer transportation to and from ports or hotels, and there was no pressure to make a purchase from the sales area. 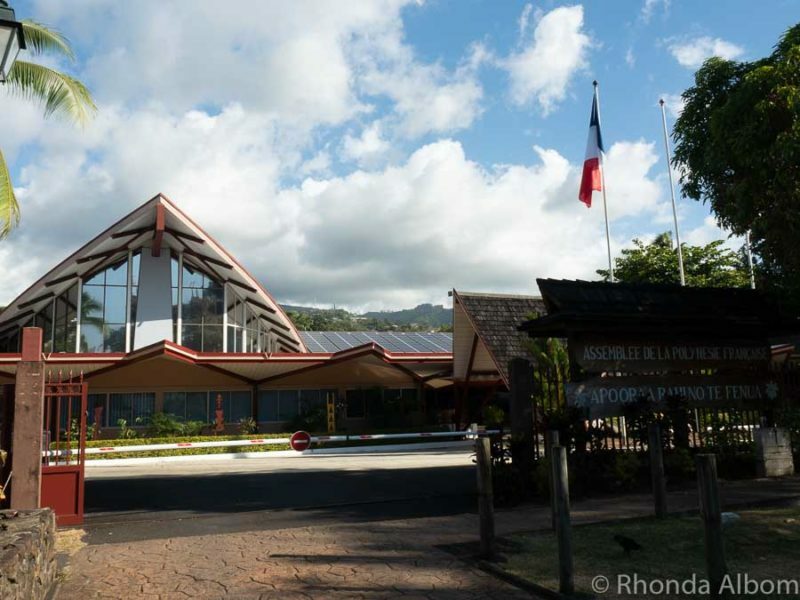 This building is both the residence and office of the currently elected president of French Polynesia. The gate was open and I asked the guard if I could take a photo, and he just let me walk in, but only so far. 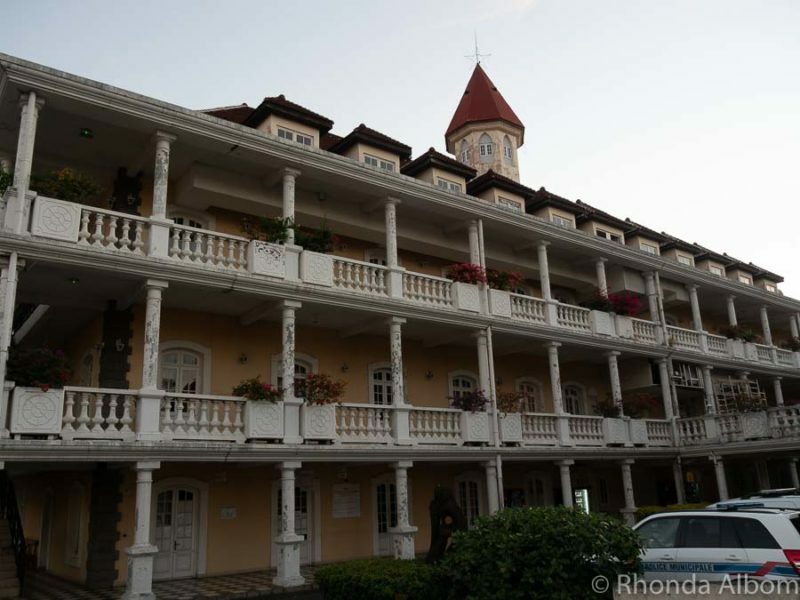 A replica of the former Queen’s royal palace, the brightly coloured Papeete Town Hall is an iconic city structure. 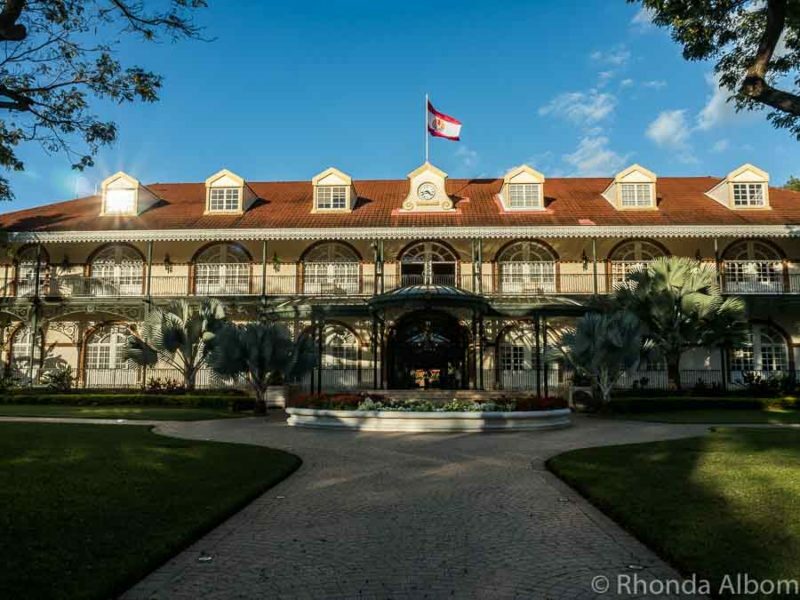 Built in the 1990s, it is a classic example of 19th-century French colonial architecture. Although we didn’t enter, it is open to the public on weekdays. ‘Roulottes’ translates as caravans in English, but these roulottes are actually mobile cafés, similar to food trucks in New Zealand. They are set up near the pier nightly, opening at about 6 pm. 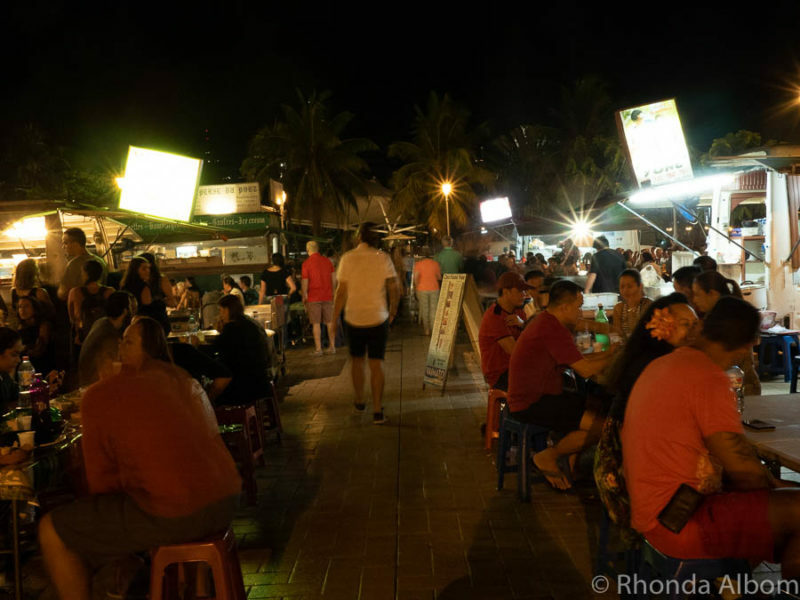 The reasonable prices and tasty food make them popular with both locals and visitors. The food in Tahiti is a mix of French and tropical flavours. The roulettes featured it all. Walking through the streets, we discovered an interesting mix of graffiti and Tahitian street art. Tahiti has its own style. 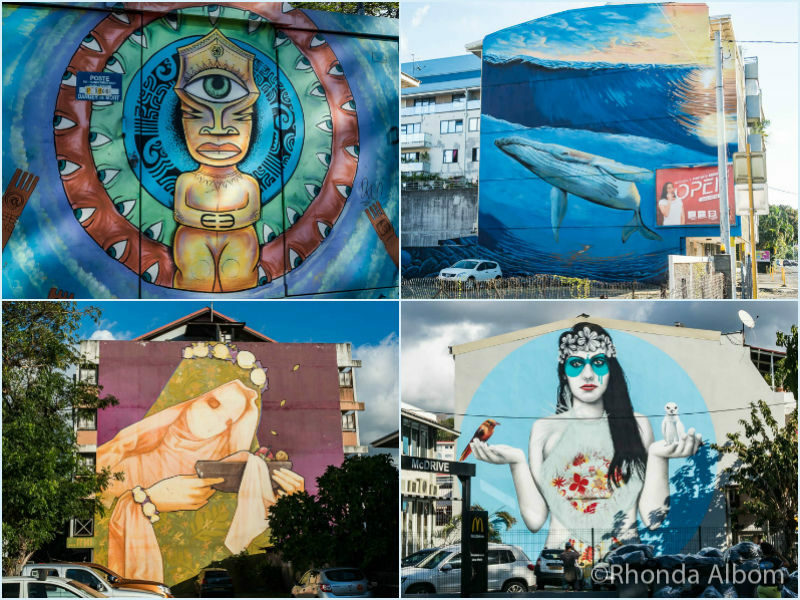 A sample of the street art in Papeete. 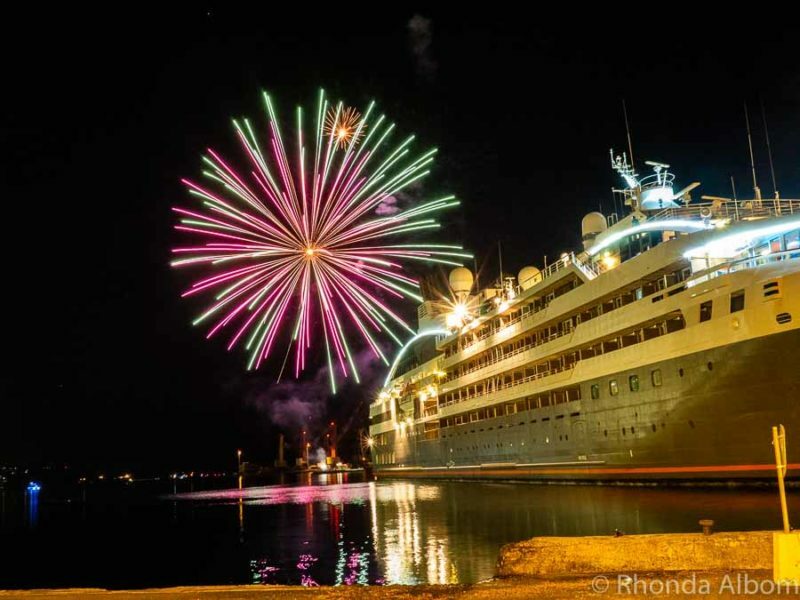 Fireworks over one of the ships docked in Tahiti don’t compare to the fireworks we saw on New Year’s Eve in Rio de Janeiro. If you arrive by cruise ship, you can see much of the downtown area on foot without a guide. Renting a car on Tahiti is easy and appears inexpensive. However, the price quoted by most of the rental companies on the island is only for the car, the mileage is extra, as is petrol. When we visited, the petrol cost 160 francs per litre (about $6.40 USD per gallon). It is 116 kilometres (72 miles) around the island. Be aware that the people onshore selling tours are not the people who will take you on our tour. Verify that your driver will speak English, that the van is air-conditioned, and that it is non-smoking before you purchase, and then again before you get in the van. Ask for a different van or driver if the one provided doesn’t meet the terms you agreed upon. ⇒ Click here to see the details of the 5-Hour Tahiti Island Tour. If you want a different type of adventure, check out this highly rated Papeete Inner Island Full-Day Jeep Safari. We sailed on the Golden Princess, one of many South Pacific cruises from Los Angeles, USA to Auckland, New Zealand. (More on our cruise coming soon.) Our ports included two in Hawaii (Oahu and Kauai), two in French Polynesia (Tahiti and Moorea), and American Samoa. This was our first cruise crossing a major ocean, and we loved. We have found Cruise Direct to offer the best prices on cruising, often offering great deals on Princess. ⇒ Click here for the latest deals on Princess Cruises. Tahiti is two islands connected by a narrow isthmus. The larger is Tahiti Nui, the smaller is called Tahiti Iti. We took the loop road around Tahiti Nui. There is no road that circumnavigates the smaller island and portions of it are only accessible by boat. The best time to visit is from May to October when there is less rain and pleasant temperatures. Pacific Franc (CFP) is the island’s currency. Credit cards are accepted in most restaurants and shops. And, some places will accept Euros, US, Australian or New Zealand dollars, but at an unfavourable exchange rate. Which of these things to do in Tahiti appeal to you? I don’t think I’ve considered going to Tahiti before, but now I really want to go. Doing a cruise sounds like an excellent idea. I’d love to visit the gardens and all of the fabulous waterfalls. Tahiti is such a beautiful and fascinating place! I’d love to visit one day! Tahiti looks amazing! So much to see, so little time! The fern grotto and the waterfall caught my attention! My son and his wife honeymooned in Tahiti, but all their videos were of the ocean / water / boats. You’ve shown activities on land to enjoy, too! Lovely! I hope to visit Tahiti some day! Such wonderful pictures. The greenery looks amazing. I am sorry you were disappointed with your tour – these things happen. It looks like you got to see quite a bit anyway. Tahiti is my husband’s dream destination. From seeing your photos, I can see why. And I didn’t realize how much there is to do there. Saving for a (hopeful) future visit. wow looks like there is alot to see there, I think the markets would interest me, so many new foods. 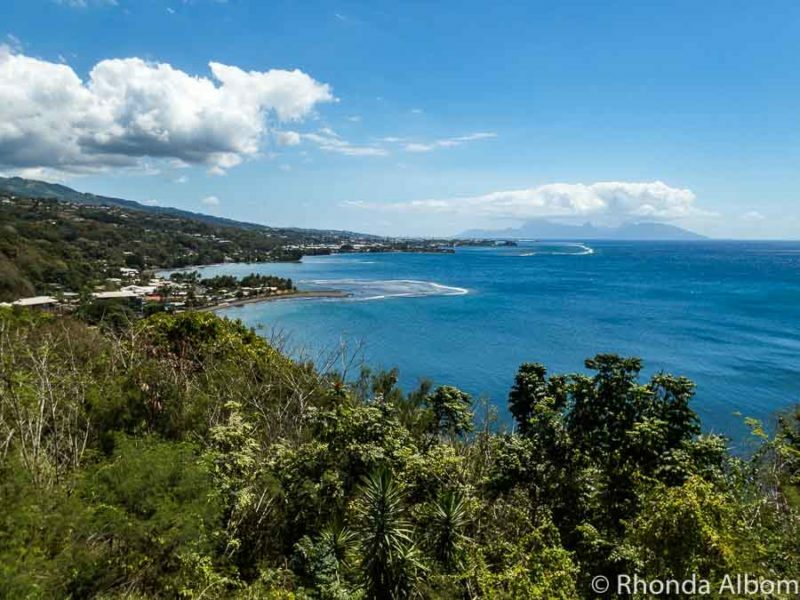 I love tropical islands and always wanted to go to Tahiti, but because Hawaii is much closer (and cheaper) for us, we always end up there when we want a tropical experience. There is a similar “fern grotto” in Kauai. It looks exactly like this one. I love your street art photos. You have a special talent do discover street art wherever you go. How come I never stumble upon such beautiful murals? Wow, it looks like there is so much to do! I would love to get to visit someday! It looks so clean and refreshing. Well, i’ve always said i want to see Tahiti, and i hate flying, so maybe someday i can cruise there! Wow! Tahiti looks so beautiful an there seems to see that there are so many things to see. Fantastic job Rhonda. See ya from……….. I would love to visit that market and check out the street art too! My goodness, Tahiti is simply breathtaking!! Those waterfalls are just stunning. I wish I could go there! Wow! What a wonderful place! The Waterfall and the water gardens. I love nature and I feel happy surrounded by it. I wish I could visit this place one of these days. Your photos are amazing! Seems to be a fabulous destination to visit. Enjoyed your panoramic photographs. This sounds like such an idyllic location! I would love to visit Tahiti! Thanks so much for sharing! Maraa Fern Grotto is pretty. I wonder if Gauguin painted something based on it. The view from One Tree Hill is beautiful as well. Tahiti is so exotic and beautiful! this is a great list of adventures and activities! To me nothing feels more exotic than the mention of Tahiti. Thanks for sharing about this interesting place. I would love to be there and enjoy the scenery. This place looks incredible! Love the pics! Tahiti is so stunning! I hope I can visit there soon. I have always wanted to go to Tahiti. The place looks superb. U had a great time. It sounds like you really need to prepare ahead and research your tours. I’d want plenty of time at all of those stops and not a quick drive-by. Beautiful. Great shots and it’s ever so warm. We’re finally getting some warm here. 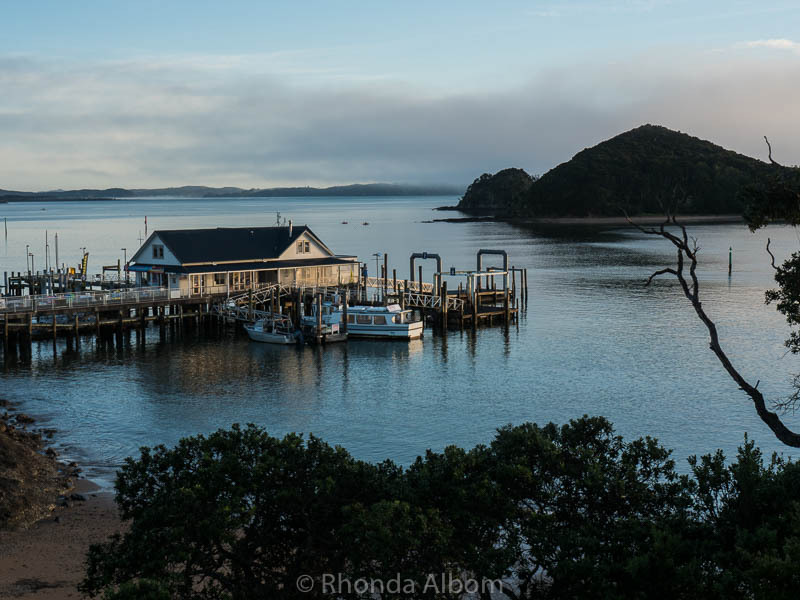 Gorgeous place Rhonda. Lesson learned with that driver; pre-booking is key to get a clear idea of how the tour will go. Trust factor, when you get referrals from other travel bloggers or trusted resources. Tahiti is absolutely beautiful. What an amazing selection of things to do. The Pearl Museum looks really interesting and somewhere my family would love to visit. Traveling is exploring, it is going beyond the idea that a place can be had. Coulson was right! Tahiti? It’s a magical place! WOW. Amazing. Long been on my list after I spent 4 months in Fiji. I adore the South Pacific. A lot to see and do! Gorgeous shots. There is so much to do and see in Tahiti! I love how green their flora is and the culture you captured is so intriguing! I’d definitely travel to there. i am dying to go to tahiti. it looks like such a beautiful and magical place. I’m not big on cruises, but I’d love to stay there for a couple weeks!